Yep that's right. The neutral monster has swallowed me up and spit me out....thank goodness he left my hair in tact (well, kinda). I just couldn't resist the pairing of this utility shirt with the feminine dress and heels. Sometimes you just gotta go to the monochromatic side every once and a while! Neutral monster? I think not! More like, neutral beauty. :) Looking fab from head to toe, Nicole! Adore the fiery hues (and matches the background art). You make neutral colors look so chic! I think neutrals are amazing on you. I kind of love the background of that painting in the wall. It's just such a great contrast with your outfit. I love this combo, and those shoes are fab! loving the neutrals and the shoes, very nice. love your look! Wow. This is adorable. It's a look you can wear everywhere. So you are not going to dye your hair beige?!!! Just love your outfit. So versatile. Love those little buttons up the side of the dress! All about it! Especially LOVE the shoes and bag. Looking good girl! 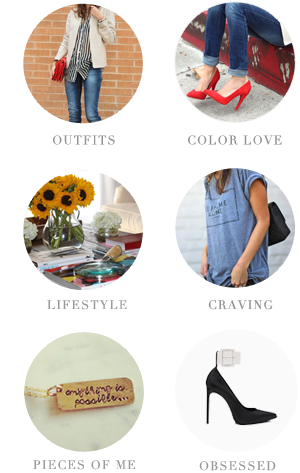 Loving that pop of red on top of all the neutrals. This whole look screams "I'm hot. I'm chic. And I certainly don't give a *^%$!. Great jacket/shirt and with the splash of colour with the clutch! Genius. I die every time you wear those shoes too. love the outfit...and the shoes are great!! Love the outfit and the colourful clutch is beautiful! The shoes are also TDF! I'd never trust myself with Suede Shoes....it always rains when I wear them. This is so perfect with the red bag! Love it. You look absolutely stunning! 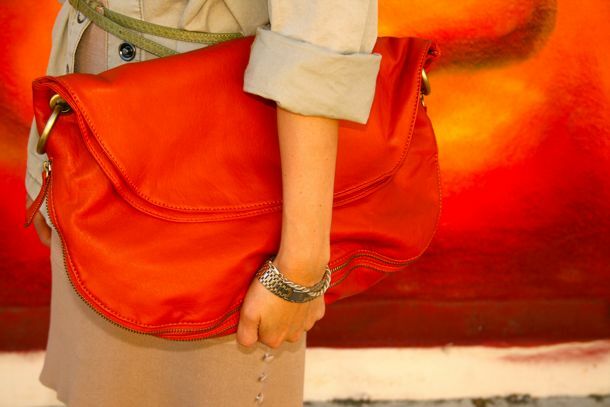 I adore the neutral tone of your outfit with the bright orange bag to add a great pop. And that's a great backdrop for your photos too! you slay me with your popped collar.. love it! great neutral ensemble, adore the loubs. Oooh honey, spittin' hot fiyah in those Loubs!!! Love the neutral ensemble...so chic! That bag is gorge btw...totally amps up all of your ensembles! OMG your bag is so fun!!! D.I.E!!!! i love it even tho it's colors from the same family you still manage to make it totally interesting and unique!! ADORE that utility jacket!! i'm a total neutrals girl so i really like this! Neutral done sooo well! LOVE the orange!!! Fab pairing of neutrals and backdrop. And Loubys too. Your oversized shirt looks amazing the way you style it. Very very stylish. A great monochromatic look....you are smoking!!!! the shoes are fierce. first thing i noticed in the first pic. then i saw the red bottoms :) i can pick 'em. ha. Gorgeous outfit! Love all neutrals; one of my favorite summer trends! every time i see u in those shoes i want them MORE and MORE! Hi! Love your blog and am your newest follower. I read your "about me" section and thought you could be describing me! (also bc I thought your name was Frankie-that's mine). Shoe obsessed-yes please! Lovely lovely bag. The color is just perfect. I love your whole ensemble - neutrals look so great with a pop or firey tones! your shoes collection just keeps getting better and better! I love your style girl !! you have such great posts! i think you'd really like the wear to go girls http://www.facebook.com/pages/The-Wear-to-go-Girls/138631736207424?ref=ts#!/pages/The-Wear-to-go-Girls/138631736207424"